Leaves warehouse in 3-4 business days. Converts easily with the touch of a button. Polypropylene bumpers absorb impact for added protection. Aluminum deck is both highly durable and lightweight. Moldon rubber wheels provide durable support. Two different platform length settings with push-button release for quick conversion. Anti-impact, nonskid polypropylene and aluminum deck. This lightweight platform cart makes moving objects quick and easy. Afterwards, its folding handle allows for easy storage. Lightweight aluminium yet handles heavy loads. Comfort grip with telescopic handle. Simple push button retracts and folds cart into a compact size. 4" Non marring shock absorbing rubber wheels. Expanded load pad size : 29"x18". This item is so convenient for all kinds of loads and stores well. I used it in a building that required loads to go through the freight elevator but when security caught me going through the regular elevator they did not know what to think because it appeared as though I just had luggage and could fold it up, tuck it under my arm and be on my way. I will tell you how much I love this cart. My library dept. has probably purchased at least 10 of these or more. Our jobs are out in the community and we take books and flyers where needed. When I retired, I knew I needed one for my home for my business. I purchased this cart to use in showing my cats. It is the best cart I have ever used, easy to roll and fold up. The only thing I wish it had was a wheel lock to keep it in place. Outstanding, had a similar cart for over 10 years until the handle finally broke. This looks much sturdier and is easier to extend. The wheels are better as they roll easier. Should last a lot longer, use it 4 or 5 times a month with the maximum load weight and have no problems. This item is very easy to use and because it is foldable it fit in my SUV very easily. It is also very sturdy and well made so it can hold quite a load! The foldable/extendable mover is very lightweight but sturdy easy to handle stores easily in a small vehicle just like advertised! I use the cart to put dog crates on when I go to a dog show. It is a very nice crate BUT I did change the location of the swivel wheels which made it alot easier to manuever. I needed a light weight, compact cart to move heavy musical equipment from our SUV to stages and back again. My wife and I play in our own 6 piece C/W band, so we haul the PA as well as our instruments and amps. I needed a slightly larger loading surface, so I fabricated a removeble plywood platform and covered it with indoor/outdoor carpet to fit on top of the existing one. All I do to use this is unfold and expand the unit and slip the platform on top. One end is notched to fit through and under the upright handle, so it stays put. When I'm finished loading equipment, I just reverse the process and store the compacted unit and platform in my vehicle and drive away. Also, I found it much easier to manuver the cart with the swiveling casters under the handle, so I unbolted all four and switched them end for end. This works much better for me than the way they were mounted from the factory. All in all, I'm very happy I purchased the Foldable/Extendable Mover and highly recommend it. It's designed well and built with high quality materials. I'm hoping it will continue to serve me well for many years to come. Great handtruck for carting boxes of pots to exhibits and craft shows. Easy to fold and open just as shown in video, and fits into small space after my vehicle is loaded with boxes and shelving units for display. Not too heavy and well made. I love it! I recently downsized to a smaller home & need to keep property in storage. This product helps so much with transporting boxes that are too heavy to carry. It's lightweight and compact enough to lift and store in my car. I like the swivel wheels which makes it effortless to push or pull around corners & tight spaces. The design makes it easy to strap boxes securely with bungee cords so the load doesn't slip off. I'd like to find a collapsable crate to keep in the trunk as well to be ready to transport random items. It helps me be more independent! This is exactly what I hoped it would be and it does just what I want it to do. I load it up with my boxes and trash bags and wheel it easily to the curb. You can steer it or pull it with ease. Best purchase I've made in a long time!!! We love the new cart. It helps moving musical equipment in a snap. We changed the wheels from front to back to make it roll better. I am hoping it will hold up to all the work we put it through. It seems a bit lightweight. This cart is light, compact and easy to push and expand. But it's also durable and strong. We are very happy with this purchase. We mainly use it for moving boxes of print items we're in Communications and signs/displays. It's easy to maneuver. Great product! This is so light weight! It folds down so small yet is sturdy enough for all of my events. This is our second of this model and we love it! I love this mover! I haul everything on it. The extendable feature is as long as a standard laundry basket. Shopping trips are a breeze and groceries fit nicely in a box on top. The compact size makes it ideal for storing in the car. I liked my folding hand truck, but this is definitely a step up. The only complaint I had was that that I didn't like the way the wheels that were free moving to allow turning were in the front. It made it awkward to push and pull. I got out my ratchet set and swapped the two front fee wheels with the two straight wheels in back and now it works a lot better. Easier to push, pull, and manuver with the free wheels in the back by the handle. I highly recommend this cart to everyone! This product is excellent. On a weekly basis I use it to carry over 120 lbs. of audio equipment and speakers to and from Church Services. It has made my things so much easier for me. This is the best mobil cart we have found and has stood up to travel the best. It is nice product and easy to carry. Strong and light. We have used this cart since we purchased it and it has made carrying equipment to video shoots, quick, efficient, and less time consuming for the crew. 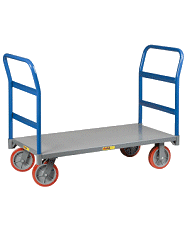 If you have a need for a platform hand cart that sets up quickly and is very durable, I can recommend this product. I work for a large plastics extrusion company as a maintenance electro mechanic/ mold tech. My job requires me to move many tools throughout a 5 acre facility. I purchased this cart to haul my 200 lb tool box from machine to machine. It rolls great over all types of surfaces from rough water covered concrete to carpet. When I received the cart, I had to move the handle to the opposite end from which it was designed to give me more handle height and I moved the swivel wheels from the front to the back to make it more manueverable in tight spots and that allowed me to push it or pull it with better control. Moving the handle to opposite end also made the wagon more rigid. The collapsible handle makes it great for rolling under low hanging equipment. This is a great little light weight wagon. I love the mover. The only other feature I would have liked is for the handle to lock when in the down position. When the mover is folded down into compact form I want to grab the handle to pick it up. Because the handle doesn't lock, it opens back up when you grab the handle. I have gotten used to grabbing the unit by the side. Other than that I love the unit. I have used it around the house and have even taken it to the beach to transport things from the car to the sand without any problems. I recently had to move tons of files out of an office. This cart was perfect for the job. I love it. Light weight but strong, it folds up and can be easily stored in my car. This product is of excellent quality and easy to use. Excellent and very easy to use and store. Our Marketing Department uses the Foldable/Extendable Mover all the time from moving our products at trade shows to around the office. Highly recommended. Five stars all the way!